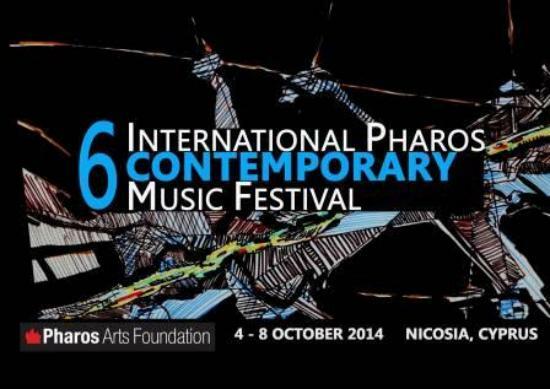 The INTERNATIONAL PHAROS CONTEMPORARY MUSIC FESTIVAL has established itself as one of the most innovative and cutting-edge annual music events in Eastern Mediterranean. Under the artistic direction of the renowned Cypriot composer, Evis Sammoutis, the Festival is dedicated to the promotion of new music: The well-established masterpieces of the contemporary music literature of the 20th century as well as new works by the younger generation of composers, some of whom are commissioned by the Foundation to write new pieces especially for this occasion. 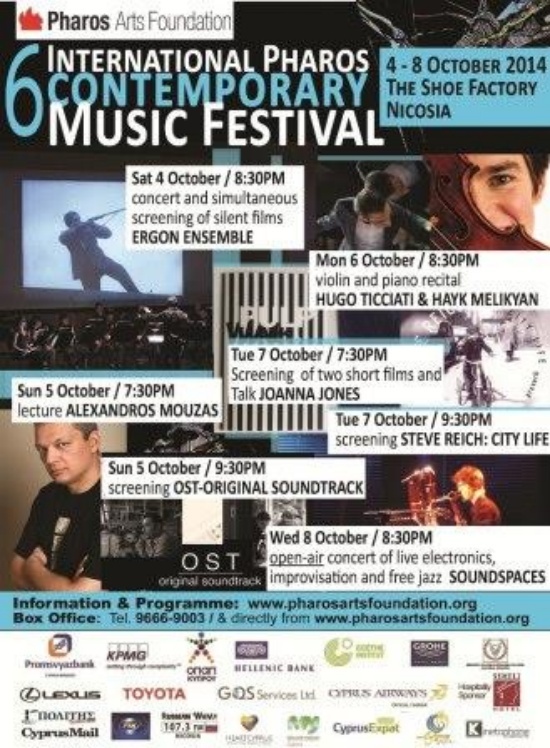 Organised between 4 and 8 October 2014 at The Shoe Factory in Nicosia, the 6th International Pharos Contemporary Music Festival focuses on the connection of new music and other forms of art, as well as alternative forms of contemporary music such as “free jazz” and electronics. The Festival will open on 4 October with an innovative concert-concept by the Ergon Ensemble during which films of the ‘silent era’ will be screened simultaneously with the live performance of new works, attaining therefore a new dimension, character and denotation. 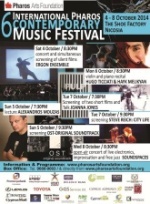 Over the span of five days, the Festival will feature a number of exciting events such as lectures, documentary screenings, educational activities, a recital with pianist Hayk Melikyan who returns to Cyprus to join forces with the fascinating violinist Hugo Ticciati, and it will conclude on 8 October with Soundspaces – “A concert of live electronics, improvisation and free jazz” by Johannes Schwarz (bassoon) and Sascha Armbruster (saxophone). The concert will take place at the roof-garden of The Shoe Factory which will be transformed for the first time as an exclusive open-air concert platform, where the audience will be able to enjoy an extraordinary, unconventional, musical experience in a leisurely setting with a glass of wine. CONCERT “SILENT FILMS & MUSIC"
SCREENING OST-ORIGINAL SOUNDTRACK:"A DOCUMENTARY FILM ABOUT MUSIC IN THE MOTION PICTURES"
SCREENING STEVE REICH: CITY LIFE "A DOCUMENTARY"
***All events will take place at The Shoe Factory main hall, with the exception of the last concert, on 8 October, which will take place at The Shoe Factory roof-garden. The Shoe Factory is situated in the old part of Nicosia, near the buffer zone. Through it, the Pharos Arts Foundation is helping to revitalize this beautiful and historic section of the capital city by attracting a wide and diversified younger audience. All concerts are characterized by a unique feeling of intimacy and music is performed in an exceptionally inspiring setting: a modern venue decorated with contemporary art by mainly local artists; a venue situated in the “run down” part of Nicosia that offers the audience the unique opportunity to sit within an amazing proximity to world famous artists and experience performances in a venue like no other.